Does your Company have Workman's Compensation and Liability Insurance? Yes, we can provide you with an insurance certificate. The certificate should be furnished by the insurance company and not the foundation repair company. Does your Company pull permits when required by the City? We offer a lifetime warranty on pushed pilings and a ten year warranty on drilled piers. Both warranties are transferrable. Can trees cause and/or contribute to my foundation problems? 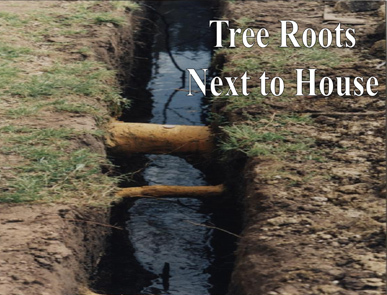 We have found that any large tree or bush can cause foundation settlement of a slab foundation. A few of the "really bad plants" are: Weeping Willow trees, Cottonwood trees, Mulberry trees, Pecan trees, Maple trees, Ash trees, Bradford Pear trees, Red Tipped Phontinia Bushes and Wax Leafed Ligustrum bushes. Studies at the University of Texas have shown that most trees or bushes can have a root system that reaches out as far as the plant is tall! One sure fire way to tell if the water needs of the trees or bushes are causing your foundation problems is to watch and see if your building "goes down" during the growing season and "comes back up" when the plants go dormant in the winter and during several slow, deep soaking rains. The answers to these questions should help you decide who you want to repair your very valuable property. Price alone should not be the decision maker for such an investment.